Bees, butterflies and loads of beneficial insects love this Golden Butterfly Bush. This Buddleia or Buddleja is a large, dark green shrub with hundreds of yellow-gold blossoms that are round to oval. It has dense tight foliage that makes a nice privacy hedge, at least in the summer. Like most butterfly bushes it will remain evergreen in warm winter climates. This plant is sometimes available in plug trays. These trays hold 128 of all the same plant. They are a great low cost way to fill a lot of space. Each cell is 3/4 of inch by an inch. 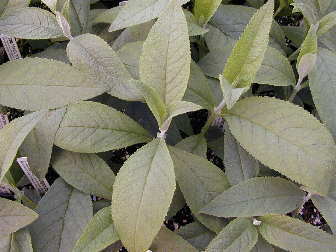 Check here to see if Sungold Butterfly Bush Plug Trays are available. Sungold Butterfly Bush makes a great addition to our Wildlife Herb Garden Six Pack and to our Zone 5 or Zone 8 Fragrant Herb Garden Six Packs.